Earth Diggers is the one stop destination for all purpose Earth Moving Elizabeth services. 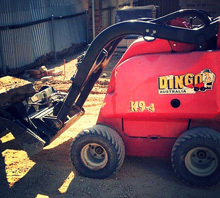 Our services include dingo, trenching and post holes, landscape preparation, bobcat, rubbish removal, laser levelling, concrete cutting, irrigation, retaining walls and tuff installation. We are running a family business for years and all throughout we have maintained high standards of service. Evaluation of each project is done closely after project completion to understand our shortcomings and improve it for betterment of our services. We are trusted by clients for our efficiency and timely service. The budget is not too high yet there is no compromise in the quality. We provide services for domestic and commercial sectors and handle all our projects with equal importance. Call us for a free quote.